Sarracenia are the north American Pitcher plants and are very easy to grow. These carnivorous plants vary in height and colour however all are similar in care requirements. These are the trumpet pitcher plants, perhaps the easiest of all of the pitcher plants to grow. They are from north America and are basically a swamp plant. They do vary in colour as well as in growth habit. Some varieties having tall pitchers up to 1 metre (36 inches) and others low to around 15cm (6 inches). Most have a basal rosette of foliage. All live on small insects, which enter the pitcher and are then dissolved in a fluid. The pitchers themselves are fascinating, the flowers that appear in spring are also very attractive. These are a very easy care carnivorous plant, they require a moisture retentive growing medium and are best in good sun. A slightly acidic soil or growing medium is best and a mixture or 70% peat moss and 30% perlite works well for many growers. In containers, the plants should be potted into the growing medium in a pot that is around 15cm (6 inches) tall. This pot can then sit in a tray of water around 2.5cm to 5cm (1 – 2 inches) deep. During the growing season, after regularly. Once summer comes around, cut back on watering, allow the soil to dry a little however keep the pot sitting in water. 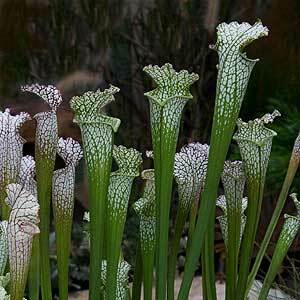 Sarracenia will have foliage die back, as well a pitchers that die. The dead pitchers should be removed as they occur. Dead basal foliage is best removed in spring. When watering, rain water is best, if using tap water let it stand for 12 hours before watering. Fertiliser is not needed as these plants live on insects. As winter comes around its time to remove all of the dead material to prevent fungal problems over winter. The best time to divide sarracenia is in early spring just before the new growth commences. Take the pot and remove the clump from the pot. You will see the root system. Loosen the potting soil or compost from around the roots. The rhizomes with the growth above them can simply by pulled apart or cut with a sharp knife or secateurs. Cutting is the best method as this provides a nice clean division which will heal more quickly. divide them into rhizomes with a growth shoot on each one. Use a 50% peat moss 50% perlite in a deep pot. Place the cutting with the new shoot towards the centre of the pot. The rhizome should be just below the surface of the soil. Water in and then treat as normal. The lower growing varieties are a little more difficult as the growth points are more brittle. S. psittacina – The parrot pitcher plant, which is low growing and forms a rosette of pitchers. You can buy Sarranacia in Australia from the following growers.